Martin Luther King, Jr.’s late widow wrote in fervent opposition to Sessions’ 1986 nomination to the bench. Until today, her testimony was lost to time. A potent new voice joined the chorus of opposition to Donald Trump’s nominee for Attorney General, Sen. Jeff Sessions (R-AL), on Tuesday night — one from beyond the grave. 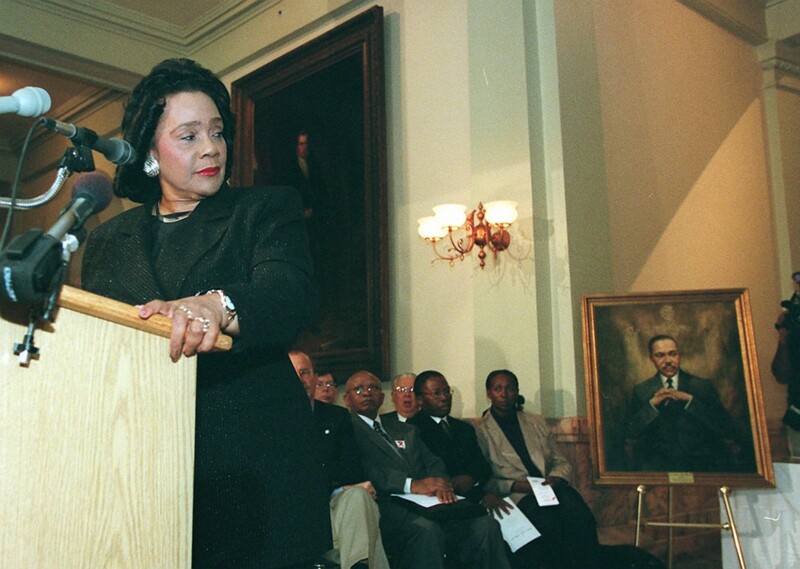 The late Coretta Scott King famously opposed Sessions’ 1986 nomination to a federal judgeship in Alabama. But because then-Judiciary Chairman Strom Thurmond (R-TN) had never entered her 1,800-word letter testifying against Sessions into the congressional record, no copies were publicly available as Sessions faced his Senate colleagues on Tuesday morning. Buzzfeed reported that Chairman Chuck Grassley (R-IA) had declined to release a copy and that no others were publicly accessible. Tuesday evening, the Washington Post published the letter and testimony in full. In it, King invokes her slain husband to underscore not just the importance of voting rights, but the impropriety of Sessions' conduct in the 1984 prosecution of black ballot access activists who had marched with King in Selma. "The actions taken by Mr. Sessions in regard to the 1984 voting fraud prosecutions represent just one more technique used to intimidate Black voters and thus deny them this most precious franchise," King wrote in her testimony. "Mr. Sessions sought to punish older black civil rights activists, advisors and colleagues of my husband, who had been key figures in the civil rights movement in the 1960s." "In fact, Mr. Sessions sought to punish older black civil rights activists, advisors and colleagues of my husband, who had been key figures in the civil rights movement in the 1960s. These were persons who, realizing the potential of the absentee vote among Blacks, had learned to use the process within the bounds of legality and had taught others to do the same." King's description of Sessions’ conduct runs directly counter to his defense of the case from Tuesday’s hearing. "The prosecution sought to protect the integrity of the ballot, not to block voting," Sessions said. "It was a voting rights case." As a young prosecutor, Sessions decided to bring criminal voting fraud charges against three people: Evelyn Turner, Albert Turner, and Spencer Hogue. Sessions says that black elected officials pleaded with his office to prosecute the three over their handling of absentee ballots; that FBI agents observed the three accused dropping absentee ballots into mail boxes; that some of those ballots showed signs of having been filled in, erased, and re-filled; and that the voters involved testified that the Turners had intentionally changed their votes. Sessions' recounting of the case is damning. But he lost. A jury acquitted the Turners and Hogue. And King’s letter, along with deep reporting on the case from The New York Times and others, helps to explain why Sessions couldn't win what he portrays as a slam-dunk prosecution of nefarious ballot crimes by a trio of people who'd dedicated decades of their lives to organizing and registering black voters in the face of violent intimidation by Klansmen and lawmen alike. “Witness after witness among the 17 voters who testified said that while they’d received assistance from the Turners and Hogue to fill out their ballots, they’d done so willingly,” the Times notes of the Turner trial, while six who were members of the same family “said their ballots were altered without their permission.” A judge threw out part of Sessions’ team’s interpretation of voting law, and a jury acquitted the trio of the remaining charges. In her 1986 letter sternly opposing Sessions’ nomination to the federal bench, King offers additional detail of how his staff and the FBI agents he pulled into the investigation allegedly manipulated the voters involved, and of allegations of prosecutorial misconduct by Sessions. To King, Sessions was intentionally misusing his office to intimidate black voters and dilute their political power, directly undermining the legacy of the work her husband had led across the South, alongside people like the Turners. “[T]he motivation was political, and the result frightening — the wide-scale chill of the exercise of the ballot for blacks, who suffered so much to receive that right in the first place,” King wrote. "Therefore, it is my strongly-held view that the appointment of Jefferson Sessions to the federal bench would irreparably damage the work of my husband, Al Turner, and countless others who risked their lives and freedom over the past twenty years to ensure equal participation in our democratic system." Sessions' confirmation hearing for the Attorney General job resumes Wednesday. He is unlikely to testify further in person, as the panel instead turns to a long list of witnesses for and against his candidacy. One scheduled witness: Rep. John Lewis (D-GA), who was walking directly in front of Al Turner on Bloody Sunday in Selma in 1965.